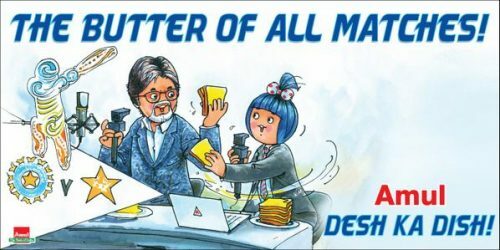 The Moppet girl wearing a polka dotted dress and a small pony tail tied with a red and white bow has become synonymous with the Amul Butter. 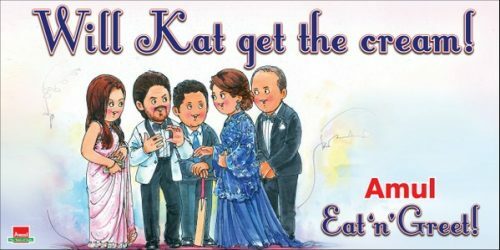 Amul Butter has redefined the way food products are advertised to the people. 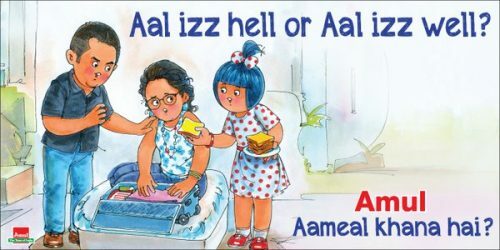 Amul Butter uses clever topical advertising with a good dose of satire and humor, to generate higher brand recall. 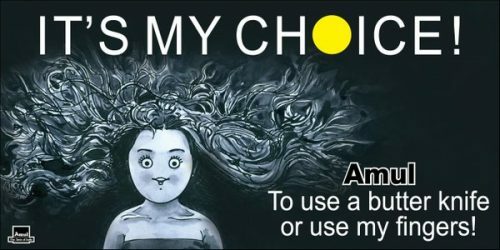 In fact these topical ads from Amul Butter are recognized as one of the longest running advertisement campaign. 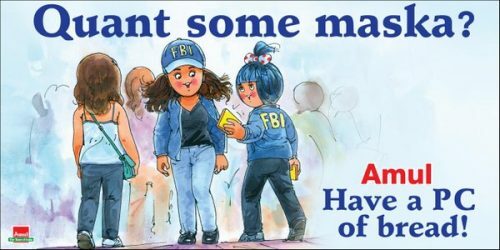 The Topical Amul Butter ads give us something to smile and ponder about raging issues and current events and that happen around the world. 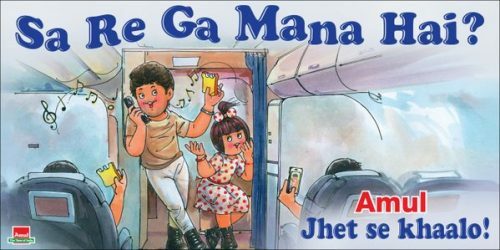 Bollywood features in these Topical Amul Butter ads too. 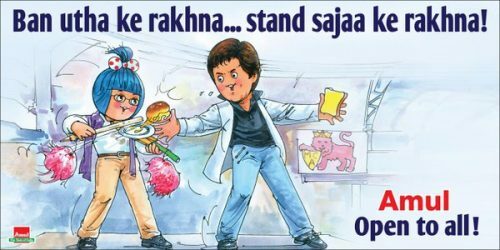 Today we share some of these advertisements that capture the controversies and happenings in and around Bollywood. When Bollywood dominated the 63rd National Award. When the royal couple, Prince William and his wife Kate Middleton on their first visit to India, met Bollywood stars Shah Rukh Khan Aishwarya Rai, Parineeti Chopra, Huma Qureshi and other Bollywood A-listers at the gala dinner. When Pakistan denied Visa to Anupam Kher. 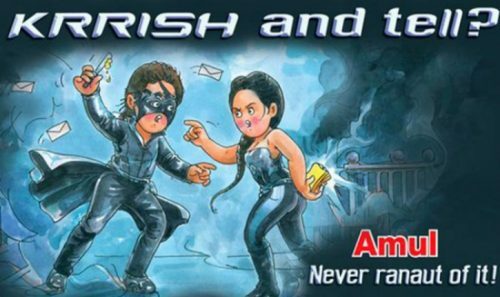 Kangana Ranaut and Hrithik Roshan’s alleged affair controversy and legal tussle. Aamir Khan’s controversy on insecurity and intolerance and that his wife suggested moving out of India. 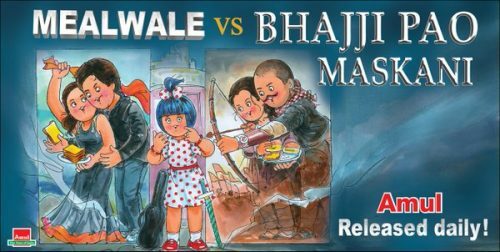 When two blockbuster movies Dilwale and Baji Rao Mastani were released on same day! When Shashi Kapoor was bestowed with the Dada Saheb Phalke Award. 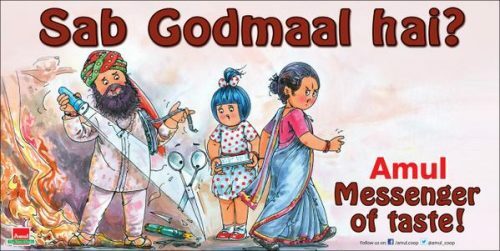 The controversy over the movie, ‘Messenger of God’, featuring Dera Saccha Sauda chief, Gurmeet Ram Rahim Singh and resignation of Censor Board members. On Deepika Padukone’s Vogue’s women empowerment campaign video. Controversy on Hema Malini’s dream project of setting up a dance institution. Marathi film ‘Court’ is India’s official entry to Oscars 2016. When Amitabh Bachchan made his commentary debut at the India-Pakistan match of the World Cup. Priyanka Chopra debut in American thriller TV series Quantico. When veteran actress Sadhana Shivdasani passed away. When Sonu Nigam sang on a Jet Airways flight from Mumbai to Jodhpur, and the airline suspended the cabin crew. When Amitabh Bachchan sang the national anthem ahead of the India vs Pakistan encounter at Eden Gardens. 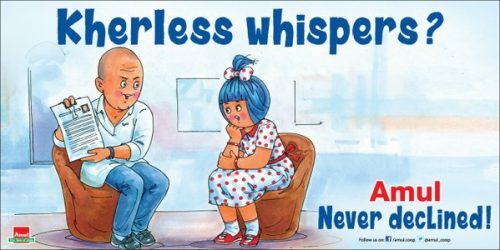 Love story of the most talked about couple, Virat Kohli and Anushka Sharma. 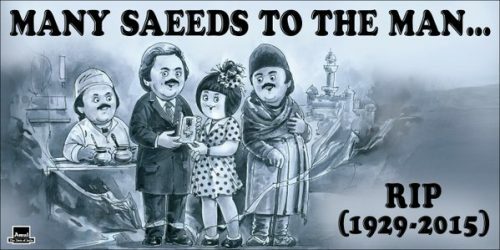 When veteran actor Saeed Jaffrey, who delighted fans all over the world with his masterful screen presence and performances, passed away. When Shahid Kapoor and Kangana Ranaut won the Filmfare Award for Haider and Queen respectively.